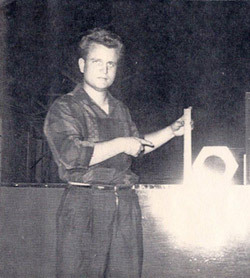 as manager of GSSP during the 1950's. Delta Bolt LLC was established on September 1, 1974. Since then, Delta Bolt has earned a reputation that is widely recognized and respected in the fastener industry for our integrity, quality products delivered on time, service, and knowledge of fasteners. Over 24, 000 sq foot fastener complex contains a complete line of industrial fasteners. With our domestic inventory we can insure our customers of a top quality product. We service the OEM, MRO industry. Some of the industries we provide fastener solutions to are: Chemical & Petrochemical, Refineries, Marine, Off-Shore Platforms, Equipment Manufacturers, Sugar Mills, Paper Mills, Waterworks & Utilities. Why Choose Delta Bolt for Fasteners? At Delta Bolt our management team is Highly Qualified with over 174 years total experience to provide Technical Support. We are here to help you “Solve Problems” for we know that in a highly competitive fastener distribution market a company must have a characteristic that makes it stand out. And our motto: “Where You Measure the Difference in Service” is not just a statement, it is who we are. Our shipping department checks every order for accuracy and other prerequisites such as: Mill Test Reports, Certificate of Compliances, Coating Compliances, or any other documentation that you may require. The mission of Delta Bolt is to be in partnership with our customers by providing materials and services so that we both improve in growth and profitability. The vision of Delta Bolt is to be recognized as the preferred fastener supplier by complying with 100% conformance of customer requirements. Anything less is not desirable. This is to be accomplished by our commitment to excellence in service, products and by encouraging continuous individual development and improvement to meet our customer needs. For more details on our products, or to place an order, please call (225) 272-1703 today, or complete our easy quick quote form. Copyright ©2011 deltabolt.com. All rights reserved. Legal & Privacy Disclaimer. Site by Delta Creations Baton Rouge Website Design. Delta Bolt is a Baton Rouge Louisiana specialty bolt and industrial fastener company that offers customization services and more nationwide. We ship nationwide, including states Alaska Texas California Alabama Illinois Oklahoma Pennsylvania Ohio Montana Mississippi Arkansas. We can also ship to specialty bolts to Mexico India England Brazil China Australia Japan France Argentina Canada UAE & Saudi Arabia.